"The Earth is a peacock, and its glorious tail Morocco" is an old saying that alludes to Morocco’s exotic architecture, colorful lifestyles, and general love for life. Morocco brims over with exquisite contrasts, color and mystery and all you can do is simply catch your breath in wonder. It has a timeless quality that no longer exists in the modern world, a sense that the past with all its glory and savagery still lives on, threading in and out of the present, informing with its every word and gesture. On a horse riding holiday in Morocco you are plunged into a culture, a religion and a lifestyle utterly unlike anything that you have ever experienced before; a mystery tour of a land of endless surprises, enchantment and enduring fascination, a land perfect for a very special horseback vacation. Explore Berber villages at the foot of the Atlas Mountains, fanciful adobe castles on the edge of the Sahara, and lush vegetation along the Mediterranean contrast with stern cliffs and rock formations. Hidden Trails has selected some of the best Moroccan horseback tours for our clients to choose from! Our Moroccan horse vacations offer a chance to escape the modern world and experience the exotic old tradition world, full of the bright colors and intrigue of the desert. Explore valleys that once belonged to mighty ancient kings, on our Cities of Kings horseback tour. Horse ride through the Atlas Mountains. 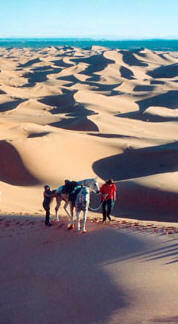 Visit a famed desert oasis on the Oasis of Tafilalelt horse riding holiday. 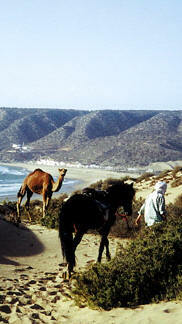 Finally, our Sable d’Or horseback tour is a taste of Southern Morocco, in the foothills of the Anti Atlas mountains. Moroccans are friendly, polite, competitive and intensely curious about the outside world. Islam is a thriving faith but Morocco's version is also extremely moderate, open minded and tolerant. You can go a long way into the heart of their culture just by feeling independent enough to accept their hospitality which pours forth from rich and poor alike whether in the city or the countryside. Such gestures of friendship are what transforms a good holiday into a great experience, for then you are no longer just visiting but really living. On each of our riding tours will be in very different landscapes. Morocco is an exciting country and there is no need to make idle promises and exaggerations. It is all there for you to experience, but we will help you create an itinerary that involves as little inconvenience as possible and steer you away from the places that may be of little or no interest to you. There is no better way than to explore this beautiful country on horseback. We will take you deep into the most remote areas and show you the culture and history on our horse riding holidays. An adventure you will not forget. A unique horse riding experience that leads you through a rich and beautiful country to the historic heart of Morocco, a heart that is still very much alive and beating. You will see the Roman ruins of Volubilis and Meknes, the town of the great king Moulay Ismail and Fez, the Islamic centre of culture, handicrafts and religion.